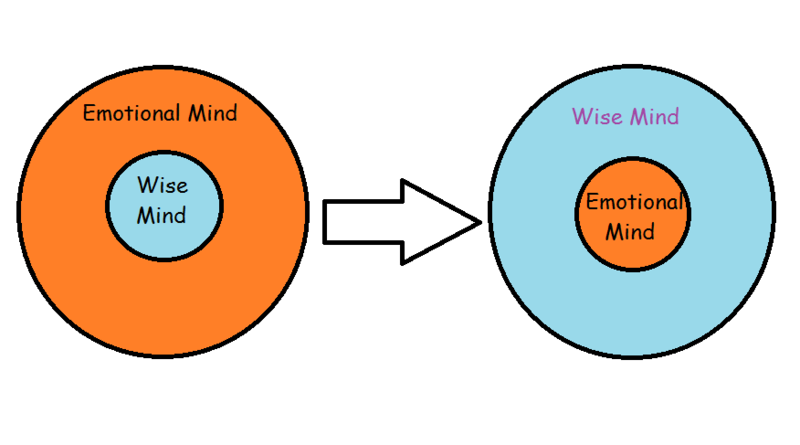 The emotional mind in control - versus the wise mind. You know those times when you feel out of control? Your thoughts are messed up. The little voice in your head is in control and won't stop chatting to you. Thoughts such as "Why did this happen to me?". "I have totally messed up!". "I'm not very good at this". "I am a bad/unworthy person". "I am not pretty/skinny/wealthy enough". "There must something wrong with me". "I am useless/hopeless/not good enough" - ad infinitum. This often happens after a negative event; a break-up, an argument, some form of mistake or rejection. Sometimes even just a 'bad day' can increase the negative chatter. This negative chatter is part of what I call your emotional mind (aka 'the crazy mind'). It's in control and it is taking you for a ride. Often a ride that just goes around and around the same block, for hours if not days on end. It's painful, it's soul destroying and it is totally cruel. But it loves to be in control. It will make you feel frightened, afraid, vulnerable and unworthy. When your emotional mind has taken control, there is a technique you can use, that with practice can reduce the impact of the chatter. The idea is based on Mindfulness, and the aim is to become an objective observer of your mind, rather than the helpless victim. Take a moment, sit quietly, connect with your breath and listen. Listen to the stories your emotional mind is spitting out. Sit, be still and just listen. Don't openly believe a word of it. You might want to label each thought: 'judgement', 'anger' 'criticism' etc. (See how labeling emotions effects the brain here) Listen to them with kindness and compassion. Sit with it as if you are sitting with a two year old having a temper tantrum. Just observe, pay attention - like a naive observer - and just watch. What is it saying now? And next?. When the thoughts start repeating themselves - acknowledge that you have already heard that thought/story (thank you emotional mind), and reconnect with the breath. Then very slowly, start bringing your attention to what I call the 'wise' mind. This is the one is is sitting underneath all that bullsh*t. It's the one that is consistent, compassionate and the real you. It's the mind that knows what is right for you. It's the one your emotional mind likes to fight with (just like a child might do to a parent). But it does not waver. It offers you love, sympathy and understanding. Sometimes, we need to give ourselves a little space to bring the "wise" mind back in control. When the "emotional mind" has taken over our thought processes (and sometimes our lives) - we can slowly but surely start to reconnect to the wise mind and then slowly bring your wise mind back in control. It might take some time but it is important not to run away from the emotional mind. It's frightened, it wants to tell you a story and it will speak louder until you listen. It may be the most difficult thing to do - but in the long run it will bring you bigger understanding to how you think, function and act in times of distress. You will start to see and acknowledge patterns, you will know what your favourite emotional mind's 'story' is. Once your wise mind is in control - you can listen to the emotional mind and realise that the two are quite separate. Your wise mind might see the stories for what they are and be able to say: "Phew - that's a big one! Where did that come from?" You may even find humour in the stories that your emotional mind likes to spew out. Slowly but surely, let your wise mind come forth and embrace the emotional mind - instead of allowing the emotional mind to be in the drivers seat. There is no need to try and 'get rid of it', escape it, drown it out or even ignore it. Bring your wise mind forward and embrace the emotional mind - and let your wise mind be back in the drivers seat. If the wise mind seems so distant and so far away - you may need to just imagine that it is there (it is - but sometimes it's difficult to locate). Imagine it as a tiny dot. And find that tiny dot, the tiny dot of wisdom in what might seem like a lot of crazy, and focus on that. That tiny speck of 'wise' will slowly come forth and grow, as the emotional mind calms.